Designed for fiber channel, fast ethernet, and gigabit ethernet applications. The Multifiber Termination Push-on connector cables are built around the MT ferrule. 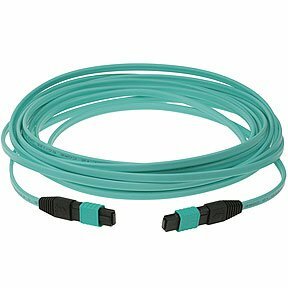 Fiber patch cables are available in lengths varying from 16 feet to more than 65 feet. All the MTP to MTP connectors are designed as a high-performance version of the MPO and will interconnect with MPO connectors. Custom lengths are also available. You can rely on SFCable for the quality of the products as all the products are manufactured by ISO 9001-2000 certified manufacturer. At SFCable you get environment friendly goods at a very competitive price. We also provide after sales services and lifetime technical support for the products.